Sean Rafferty presents a lively mix of music, chat and arts news. 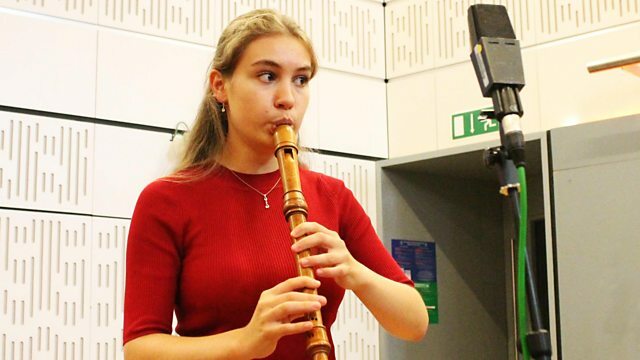 His guests include young recorder virtuoso Lucie Horsch, and BBC Introducing artist, cellist Tessa Seymour. Singer: Andrea Lauren Brown. Singer: Theresa Holzhauser. Singer: Markus Schaefer. Singer: Virgil Mischok. Choir: Simon Mayr Chorus. Ensemble: I Virtuosi Italiani. Conductor: Franz Hauk. Orchestra: Royal Scottish National Orchestra. Conductor: Jean-Claude Picard. Adams: Harmonielehre - Short Ride in a Fast Machine. Singer: Sarah-Jane Lewis. Singer: Ashley Riches. Choir: Choirs from Kender, Lyndhurst and John Donne Primary Schools. Orchestra: The Multi-Story Orchestra. Conductor: Christopher Stark. Music Arranger: Arnold Schoenberg. Orchestra: BBC Philharmonic. Conductor: Leonard Slatkin. Performer: Tessa Seymour. Performer: Alex Ullman. Singer: Renée Fleming. Orchestra: New World Symphony. Conductor: Michael Tilson Thomas. Villa-Lobos: Bachianas Brasileiras: Michael Tilson Thomas.